A clean, healthy lake is a wonderful place for both the aquatic and plant life it supports, as well as for the recreational and commercial boating and water-related activities that occur there. But since rivers and streams often feed lakes, the process of sand, debris and silt washing downstream — known as sedimentation — can easily fill a lake with pollutants, as well as excessive levels of minerals and nutrients that can cause an explosion in algae, reeds and other plant life. If no action is taken to counteract sedimentation, the process of eutrophication can occur. During this process, the water is starved of oxygen, plant growth accelerates and, over time, the ongoing accumulation of silt can turn a lake into a swamp. That’s why it’s good to know that an appropriate lake dredge can remove unwanted pollutants and materials from the lakebed and its water, resulting in a better-protected shoreline and aquatic life. Dredging takes on many forms. Sometimes lake dredging is preventative in nature and performed to keep areas free of debris so boat traffic can continue unimpeded. In other instances, a lake and its shoreline may already be damaged by pollution and sedimentation. In these cases, a form of restorative dredging needs to occur. 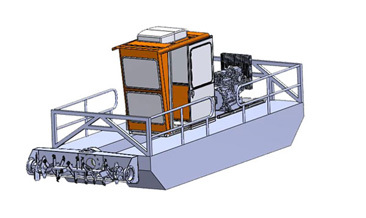 Also, there’s the choice of either mechanical dredging — which uses an excavator with a bucket to dig up sediment — or hydraulic dredging, which uses a suction pump like a vacuum to remove materials. In almost all cases, however, lake dredging involves environmental concerns. This is why the Dino6 Sediment Removal System is the preferred choice to safely remove sediment and weeds without harming a lake’s shoreline or wildlife or negatively impacting the water quality. 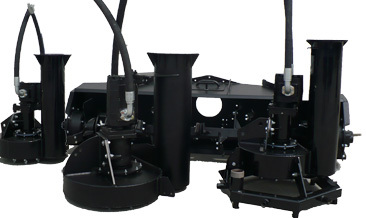 Unlike large mechanical dredges that can cause damage and erosion to a delicate shoreline, the compact Dino6 hydraulic system is ideal for lake dredging where maximum performance with minimal disturbance is key. Portability: Requiring only 14 inches of water to operate and weighing a mere 3800 pounds, the Dino6 was built with portability in mind. 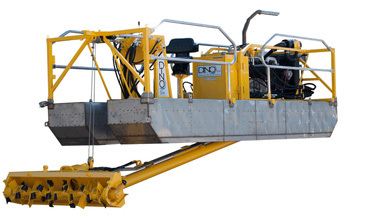 At 22 feet long and six feet wide, the footprint of the Dino6 is a fraction of what most dredges require to work effectively. Accessibility: Lakes aren’t always easily accessible, especially when a shoreline is already damaged. But while other dredges need two or more trucks to transport them, you can haul the Dino6 on one trailer with one haul vehicle. It’s a simple setup, so you can get to remote lakes that other dredges don’t have a hope of reaching. Plus, you can launch and recover the Dino6 with ease. Capabilities: Though compact, the Dino6 is an exceptionally powerful machine. Its 1500 gpm pump can pass three-inch debris, and its suction boom is equipped with a high-torque, direct-drive cutter head. When it comes to fuel efficiency, the Dino6 uses just three gallons per hour of fuel when pumping. For equipment recommendations and unbeatable customer service, contact us today. When you’re looking for expertise in lake dredging, look no further than GeoForm International.